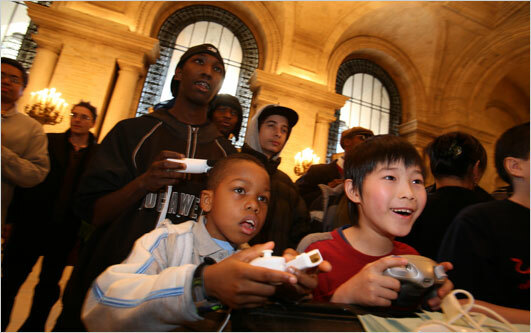 Community and university libraries are another area that have recently embraced game consoles. With the digital age and the availability of online of information, libraries are now expanding their services to include game rooms. These are being added to provide video game and educational experiences for all ages even the young at heart. Libraries that have added video games have experienced interesting trends in that teenagers are starting to come to the library in record numbers. While they have experienced increased participation “books are being checked out at a rate that exceeds what it was before the gamers arrived.” Perhaps video games are the gateway to knowledge for a whole new generation similar to how movies and music were for generations before. The benefit is twofold: libraries experience greater traffic in and out of their location, while at the same time books are available to a new audience that may not have experienced how truly great a library can be. Help teens develop teamwork and organizational skills. A lot of libraries involve teens in planning and monitoring their game nights. Teens help select the games, market the events, set up equipment, enforce time limits and so on. Furthermore, the games themselves often require teamwork and cooperative problem-solving. Video games can be beneficial. There’s no universal consensus on this controversial issue, but there’s a lot of evidence suggesting that well-designed games improve fluid intelligence and one’s ability to solve complicated, multifaceted problems.